Welcome to the SketchCop® Captured Gallery. Sketches appearing in this section were created by Michael W. Streed. Some cases are described in greater detail in Michael’s book SketchCop: Drawing A Line Against Crime. Note: Please remember that persons arrested by law enforcement should always be presumed innocent until proven guilty in a court of law. An unknown suspect approached a 5-year old girl as she played in the common area of her apartment complex. After a brief conversation, he carried her off to an isolated area of the complex and ducked behind a building. Once there, he lifted her shirt and began licking her stomach. She screamed for help, causing him to release her and flee before help arrived. A DNA profile was developed from saliva collected from her stomach area. 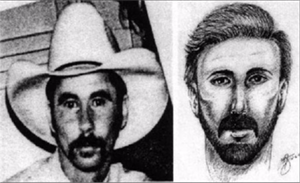 While investigators analyzed their evidence, I met with the victim to complete a composite sketch. A DNA match led to the suspect’s eventual identification and arrest. Physical evidence notwithstanding, the young witness was able to do an excellent job. Her sketch bolstered physical evidence and helped strengthen the prosecution’s case. On December 28, 2003, a male, Caucasian suspect visited a church daycare center where he dropped off gifts for the children. While there, he attended a church service. Before the service ended, he tried leaving the church holding an African-American infant. He was stopped at the door by ushers who thought his actions were suspicious. They rescued the child, but the suspect fled before they could detain him. Witnesses told police that the suspect was wearing a T-shirt bearing the emblem of a local fire department. A sketch was developed, and investigators took it to the fire department. 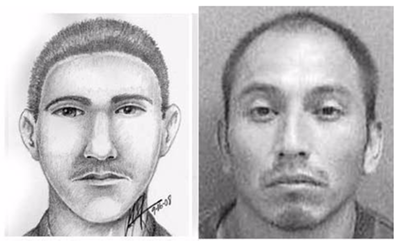 Several people there said the sketch resembled a relative of a co-worker. That person was positively identified as the kidnapper and was later arrested. Two elementary school-aged females were walking home from school when the subject tried to kidnap them. I responded to the school and worked with them to create the sketch. A few days later, a detective was having lunch in a local restaurant when he noticed a male subject sitting in a nearby booth. 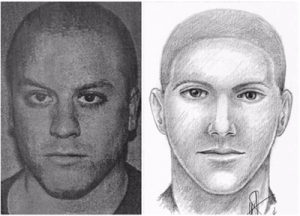 He noticed that the subject resembled the person in my sketch, including the right eyebrow ring as described by the victims also depicted in the sketch. The subject was arrested and later identified by the victims as their assailant. The suspect and the victim’s family, were neighbors in a multi -unit apartment complex. Residents of the complex were familiar with the suspect, but no one knew his name. One day, he kidnapped a neighbor’s 8-year old daughter. The suspect drove her to a remote area, near the desert, where he molested her. He left her roadside before he fled the area prompting a nationwide manhunt. A TV viewer saw the composite and called the police and identified the suspect, leading to his arrest.